Though the big Google news for today is of course the new lineup of Pixel phones, phones were only a small part of what Google had in store. Alongside their latest in mobile products, Google also used this morning’s event to announce the 3rd generation of Chromecast, the Chromecast Ultra. The last Chromecast is more of a supplement than a replacement of the current Chromecast 2. Launching at $69, the Ultra’s major feature additions are 4K video support with HDR – essentially upgrading the Chromecast to keep up with the latest in video technology standards. Alongside the new hardware, Google has also announced that they are going to be upgrading their software ecosystem for 4K, including selling 4K movies through the Google Play store. Unfortunately specifications on the hardware itself are limited at this time. Google isn’t saying much beyond the fact that the Ultra is capable of decoding and displaying 4K content. From the hardware capabilities alone it’s clear that the underlying SoC is something capable of decoding 4K content and outputting it over HDMI 2.0 with HDCP. 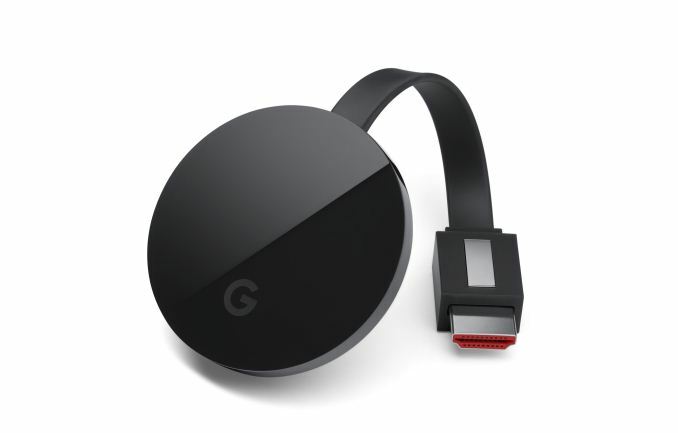 This should, with any luck, also mean that we’re finally getting a Chromecast from Google that can handle 1080p60, which has been the Achilles Heel of the prior versions of the media streamer. Given that it’s a Google product, I’d also expect that VP9 support is present, while HEVC support is going to be more questionable. On the video format front, the big news here of course is that the Chromecast Ultra can handle 4K video. However Google didn’t stop there; the Ultra also supports HDR video via both the HDR10 and Dolby Vision standards. The latter is a particularly interesting development, as to date Dolby Vision support has been very rare. I’m very curious to see where Dolby Vision factors into Google’s larger plans given that they’re bucking the trend here and have their own major content distribution platform. At least for owners of TVs that support he standard, this could help kickstart its use in streaming services. 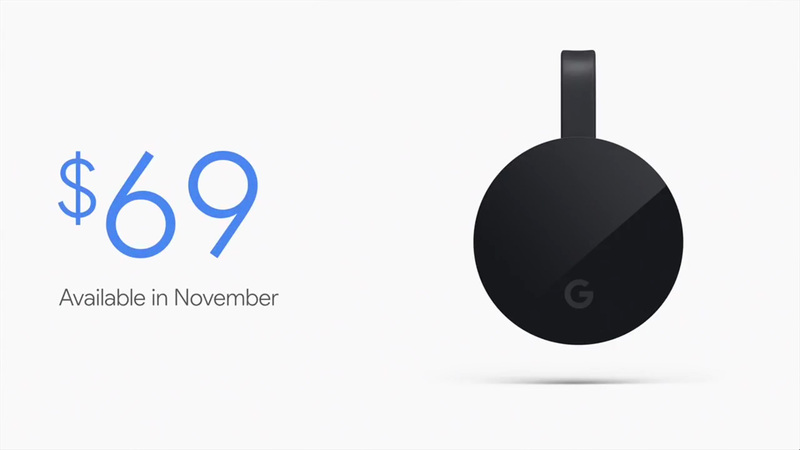 Meanwhile as Google opted to spend the bulk of their efforts on updating the internals of the Chromecast, the overall design has not significantly changed since last year’s Chomecast 2. The Ultra is still a puck – albeit one that looks slightly thicker than the last – and implements a pair of antennas for improved WiFi reception. At the same time, for users and environments who can’t make WiFi work for them, Google has added Ethernet capabilities to the Ultra by placing an Ethernet port on the power adapter, giving users a wired option to fallback to. Wrapping things up, the Chromecast Ultra will be launching in November for $69. At almost double the price of the Chromecast 2, this is not going to be replacing the cheaper Chromecast, but instead serve as a premium option for 4K. At the same time, as one of the original Chromecast’s primarily selling points was its low price, it will be interesting to see how the Chromecast Ultra does now that it’s priced closer to stand-alone media streamers. For 4K this is still very much a budget option, but it’s not going to fit the impulse purchase market like the Chromecast 2 does. Hahaha! I see you fixed the launch date as I was writing my comment. On a hunch I refreshed the page before posting. Not *entirely* up to Netflix. The device still has to support whatever format they use. Some/most of Netflix's 4K content is HEVC. I don't know if it's all also encoded in VP9. Does this support HEVC @ 4K? I would hope so but the details are scant. "Supports Netflix" is a bit vague, Ryan. If I was doing a press release and it supported the latest codec @ 4K, I'd mention it. Did they mention it? Other questions... does it support HDMI 2.0a? It only says 2.0 on the chart so I'd guess no. Dedicated remote option doubtful. I'm eyeing a Roku Premiere+ for the downstairs TV. XB1 handles the media upstairs for me. Although that will improve further once the UWP version of VLC hits the XB1. 1) I assume the Ethernet is 10/100, not GigE. It's not mandatory for media extender appliance, but it does seem to reduce buffering with high-profile content (providing the rest of the HW isn't a bottleneck).